Al-Qaeda in Iraq (AQI) is attempting to influence the Iraqi anti-government protest movement. A major manifestation of AQI’s effort is the targeting of protest leaders. These attempts are being countered by protest leaders through formation of political groups and negotiating with Baghdad. There is tremendous risk if the protest movement is militarized. Therefore, it is imperative for the Obama Administration to advise Prime Minister Nouri al-Maliki during his visit this week that addressing protest demands serves the security interests of both Iraq and the United States. Prime Minister Nouri al-Maliki arrives in Washington this week for talks at the White House. One of the likely topics of discussion will be the role of the Iraqi Sunnis in the Iraqi state. After the December 2012 arrest of bodyguards of senior Iraqi Sunni politician Rafia al-Issawi, Sunni frustrations boiled over, and a protest movement demanding better treatment from the Maliki government was born. Iraq’s anti-government protest movement is now entering its eleventh month. Since the beginning of the protests, the movement has persisted despite a variety of developments: protest leaders have faced arrest warrants, clashes have occurred between protesters and the Iraqi Security Forces (ISF), protests have been targeted by al-Qaeda in Iraq (AQI), and the Iraqi government has formed a number of committees to attempt to meet protester demands. The momentum of the protests, however, has stalled in the wake of the June 20 provincial elections in Ninewa and Anbar provinces. Now the protest movement is at a crossroads. In a worrisome turn of events, masked gunmen carrying weapons and displaying the black flag of AQI appeared at a protest in Ramadi, and they seemed to act with impunity. AQI’s appearance at this site in the middle of October reflects its desire to augment its military successes with political gains. Protest leaders are attempting to counter the AQI threat by consolidating politically and restarting negotiations with Baghdad. These efforts, however, are marred by personal differences among protest leaders and their lack of a unified position. These developments are critical as security continues to deteriorate and the competition between the protest leaders and AQI to benefit from Iraqi Sunni discontent as it intensifies. The direction of the protest movement is a crucial indicator for the future of Iraqi Sunnis. The protests have acted as a vehicle for Iraqi Sunnis to express frustrations and address grievances in a non-violent manner. If AQI is successful in changing the course of the protests, it will signal a move towards violence and increased instability in Iraq. Anti-government protests have remained largely peaceful despite their duration and previous clasheswith the Iraqi Security Forces. However, their non-violent nature could shift with a concerted effort by AQI to take leadership of protests or co-opt protesters. AQI’s recent resurgenceand increased capabilities have been on display in Ninewa and Anbar, thus far targeting military personnel and Iraqi Sunni allies of the Iraqi government. Through attacks targeting protest leaders, AQI now appears to be extending its efforts to influence the protests. Several attacks on protest leaders can likely be attributed to AQI. In Ninewa, unknown gunmen killed protest leader and tribal figure, Thaer Hazem Abed, on September 23 in front of his house in Mosul. On August 19, protest leader Haitham al-Ibadi was killed in an attacknear his house in Mosul. Religious figure and protest organizer, Ali al-Shama, was fatally wounded by an attacknear the Mosul mosque where he preaches. Ninewa member of the Council of Representatives (CoR), Mohammed Iqbal, a representative of the largest Iraqi Sunni bloc Mutahidun, condemnedthe attack, noting that religious scholars have become a target due “their influential role in making the masses aware and courageous stand against corrupt saboteur elements.” Finally, prominent protest and tribal leader, Barzan al-Badrani was killed in an attack in Mosul on August 27. In the case of Badrani’s assassination, there are allegations that “militias” killed him, a reference to the possible involvement of government-backed elements. It is very likely, however, that Badrani was killed by AQI. His area of tribal influence is south of Mosul, where AQI is currently resurgent, and his absence will allow AQI the opportunity to spread influence in the area. It is also possible that Badrani was targeted because of likely ties to other armed groups in Ninewa that may compete with AQI, including Jaysh Rijal al-Tariqah al-Naqshabandia (JRTN) whose online outletsmourned the death of Badrani. In Anbar, AQI appeared at the protest site in Ramadi earlier this month. In a videothat emerged online, masked gunmen appear holding AQI’s black flag and acting with apparent impunity. To be sure, Ramadi’s protest site has seen inflammatory rhetoric in the past, including, particularly after the April 23 Hawija clash, calls to wage jihad. However, it has not been more overtly violent than the Fallujah protest site, which has consistently retained a hardliner character. The appearance of AQI in Ramadi is worrisome for the protests. The re-appearance of AQI symbols and presence at protests will be an important future indicator to monitor. At the moment, AQI is demonstrating a great degree of capability in Anbar as evidenced by the repeated attacksin the towns of Fallujah, Rawa, Ana, and Rutba. According to Anbari tribal leader Ahmed Abu Risha, AQI is currently widely present in Anbar province. Security sources statedthat “gunmen” – likely AQI – are freely and in broad daylight appearing in Qaim, west of Anbar. Abu Risha – who fought against AQI during the awakening from 2006 onward – argued that part of AQI’s resurgence is due to the ISF’s poor treatment of the population. He particularly singled out the commander of the al-Jazeera and Badia Operations Command, General Hassan al-Baythani. All of this suggests that with increased freedom of movement in both Ninewa and Anbar, AQI’s strategy is intended to decapitate the leadership of the protests in order to gain influence over their followers. It is also likely that the targeted protests leaders have been resistant to pressure from AQI either to join an armed insurgency or to tolerate AQI’s presence. The absence of these leaders could facilitate a push by the movement towards violence and allow AQI to recruit members among the disaffected Iraqi Sunnis taking part, or at least to compel them more easily. The protest movement is launching an effort to better organize itself politically. On October 12, the formation of the “Popular Trend [Hirak] Movement” was announcedin Anbar. According to Samarra preacher and the spokesman for the protesting provinces Mohammed Taha al-Hamdoun, the trend will advocate on behalf of the Iraqi Sunnis and will act as a “social lobbying group.” This counters early reports indicating that the trend would participate in 2014 parliamentary elections as a political entity. Hamdoun has taken on a leadership role in this new group. His selection highlights the further significance that the Samarra protest site has attained since Hamdoun began acting as the spokesperson for the protests in May of this year after his selectionby the protests’ “Popular Committees.” It is important to note that despite his title as spokesman of the protests, Hamdoun faces challengesfrom the other protest leaders. However, his prominence, along with the prominence of Samarra’s protest site generally, are likely to due to support from the Sunni clerical establishment. The formation of the trend was supportedby the largest Iraqi Sunni political bloc, Mutahidun. A statement from Mutahidun viewed the step as a move to create “organized and needed institutional work” that will assist in fulfilling the goals of the protests so far. The trend was also endorsedby the clerical establishment during prayers in Qaem, Anbar. Importantly, the trend was also blessed by prominent Sunni religious leader and early protest supporter Abed al-Malik al-Saadi. He highlighted the trend’s significance by describingit as a step that will “block the road in front of those who are lurking.” This statement is very important since Saadi is considered by many to be the preeminent Sunni cleric, and his reference to “those who are lurking” is likely reference to AQI or other armed groups that are seeking to militarize the protest movement. Nonetheless, reaction to the formation of the trend demonstrates leadership disagreements within the protest movement. Shortly after the announcement, two statements were issued by groups alleging to be on the side of the protesters. In the first, a group named the “Pride and Dignity Square Revolutionaries Council” condemnedthe new trend and denied that it had authorized any group to represent them. The statement added that it will continue to protest. Meanwhile, the “Youth of Anbar Revolution” issueda similar statement and urged the founders of the new trend to reconsider their decision. Hamdoun respondedto critical statements made by Fallujah protest leader, Khalid al-Jumaili, who denied there had been any authorization given to Hamdoun. Hamdoun accused Jumaili of acting only out of self-interest and that the goal now should be “the unity and the preservation of civil peace,” not the pursuit of positions. Given the escalating violence by AQI, it is important to highlight Hamdoun’s expressed desire of preserving peace. This statement reflects Hamdoun’s fear that the social situation is at a tipping point. In a further sign of a lack of unity amongst protesters and a change in momentum, protesters in Anbar authorized the governor of the province, Ahmed Khalaf al-Dulaimi, and the chairman of the Anbar provincial council to negotiate with the government. The October 3 authorization was announced in a statementthat detailed the decision. According to the statement, the decision was taken after consultation with Anbar’s protesters, tribal notables, and religious scholars who desired to refute government claims that there “is not a clear side to negotiate with.” The statement also added that the governor and chairman were authorized because they are elected officials and because protesters are considerate of “civil peace.” Reflecting the seriousness of the effort, the statement urged other protesting provinces to take similar steps and negotiate with the government. On October 5, Governor Dulaimi met with Prime Minister Nouri al-Maliki and according to a press release from Maliki’s office, the prime minister stated that protesters demands will be fulfilled as long as they are “legitimate.” This statement is similar to previous announcements by Prime Minister Maliki and suggests that the negotiations are still at a very early stage. The negotiations effort was not accepted immediately by all Anbar protesters. Anbar has two major protest sites: a generally mainstream Ramadi protest camp, and more vocal hardline protest in Fallujah. With regard to the effort to negotiate with the government, Fallujah tribal leader Mohammed al-Bajari, who is a supporter of the protests, statedthat Dulaimi was not authorized to negotiate with the government. Bajari added that there have been attempts to “politicize” the protests and have one side influence them. This is likely reference to Mutahidun, which is headed by Council of Representatives (CoR) Speaker Osama al-Nujaifi and of which Dulaimi is a member. Nujaifi and Maliki have recently improved their relations, lending the negotiating effort more legitimacy. Shortly after the authorization was announced, two stun grenades targetedprotest sites in Ramadi and Fallujah. These attacks are further signs that protesters are divided with regards to negotiations. Protest organizer Ghassan al-Ithawi did not name the group that attacked the protest sites. Ithawi instead attributedtheir actions to the desire to “convey a message to those sitting-in that it is against the principle of negotiations with the government”. Ithawi added that the attackers used the attacks in order to protract the tensions with the federal government. The step by Anbar’s provincial council to negotiate is important for several reasons. First, the anti-government protests started in Anbar, and thus the decision to enter into negotiations could encourage other provinces to do the same. To that end, Mutahidun CoR member Wihda al-Jumaili calledon other protesting provinces to name negotiators with the government. Jumaili reasoned that local governments are “representative of all protesters” and can therefore attain legitimacy when negotiating with the federal government. The June 20 provincial elections in Ninewa and Anbar have changedthe protests’ dynamic. Prior to the elections, it was common for local politicians and community leaders to appear at the protest sites and rally the base. This type of visit has occurred less frequently since the conclusion of the elections. Politicians clearly used appeals to Iraqi Sunni protesters as a political instrument, and they likely do not view them as useful any longer. Dulaimi was likely selected as a negotiator due to his supportto the protest movement. Dulaimi’s already-established credibility as part of the protests will be enhanced by cooperating with Maliki, but it will be damaged if he is unable to deliver. Protesters demands have not changed since they were raised at the beginning of the protests, despite their partial fulfillment through the de-Ba‘athification reform and the release of prisoners. The persistence of many of the same demands after ten months means that the new negotiations will be complicated and difficult. An early positive step on the government’s part would be the release of some of the prisoners detainedduring the ISF’s Revenge of the Martyrs campaign. The political responses of the protest movement are indicative that the protest movement is struggling to maintain momentum. It is also clear that the rising threat of AQI is forcing protesters to devise new tactics to channel Iraqi Sunni frustration in peaceful directions. Forming the political Trend is illustrative of protest leaders’ plans to harness the remaining potential of the protests for the 2014 national elections. The population and Iraqi Sunni politicians are clearly fearful of the AQI challenge. AQI will likely continue to target protest leaders. Their attacks may expand to other provinces other than Anbar and Ninewa. For example, one of Diyala’s protest leaders, Shihab al-Badri, was attackedon September 7. AQI’s tactics have been successful so far, but targeting Iraqi Sunni civilians has backfired against them in the past. Therefore, it will be important to watch whether the population will confront AQI. If the Iraqi Sunnis decide to challenge AQI, they will likely call on Sahwa forces who, with the assistance of U.S. forces, successfully defeated AQI in 2008. The current Sahwa forces are presently outmatched and persistently targeted by AQI. The success of the Sahwa will depend on receiving material support from the ISF. The leadership of the ISF in Ninewa and Anbar has to recognize that the gravity of the situation requires a conciliatory approach with the populace. In essence, the population has to receive tangible benefits from the government, in particular refraining from mass and random arrests of Iraqi Sunnis during ISF operations. Otherwise, AQI will be positioned to win sympathy from the population and utilize the protests for violent ends. The negotiations with Prime Minister Maliki will likely be protracted due to the approaching elections year and also because of the past negotiation experiences. Heading into these elections, protesters and the Iraqi government have to take negotiations seriously in order to minimize AQI’s effectiveness. Furthermore, both sides should maintain reasonable expectations with regards to what can be accomplished. Raising expectations and then failing to meet them will create additional disenchantment among all Iraqis and lead to further sectarianism. These consequences will be grave for Iraq and U.S. national security interests, given AQI’s active trans-border involvement in Syria. Prime Minister Maliki’s visit is an ample opportunity for the administration to encourage him that now is the best time to address protest demands. While the regime has still failed to gain ground in as-Safira it has continued with heavy daily bombardment of the city, sparking a massive exodus of civilians. In a press release today, Medecins Sans Frontieres (Doctors Without Borders) reports that around 130,000 civilians have fled from the as-Safira area as a result of this ongoing attack. The disastrous impact of this displacement is compounded by the fact that winter is quickly approaching, these newly displaced people are seeking refuge in towns in northern Syria that are already overwhelmed with other IDPs, and few relief organizations can access the areas. The outskirts of as-Safira city are home to one of Syria’s most important chemical weapons research, production, and storage facilities. Videos from activists in the area show decimatedand abandoned urban areas, civilians being rescued from collapsed buildings (caution, graphic), and fighting around the nearby chemical weapons facilities. In late September the Syrian military launched an offensive to reopen a crucial eastern route between Hama and southern Aleppo. This route – which arcs east from Hama, through the desert and up through the Safira plain – provides an alternative to the main highway between Aleppo and Hama which is largely under rebel control. The regime lost control of large portions of the route in the September rebel wal-‘Adiyat Dabha [“The Panting Chargers”] offensive in southern Aleppo province. If the regime can gain control of this eastern route, it will gain a critical lifeline to forces stationed at the Nayrab and Kuweires air bases and as-Safira military base and chemical weapons facilities. Kuweires has been largely restricted to aerial resupply for several months due to ongoing rebel siege, and battles for control around Nayrab and as-Safira have made regular ground resupply difficult for the Syrian army. The first indications of the regime counteroffensive came on September 27-28 when Syrian activists on social media began reporting sightings of a large military convoy with well over 100 vehicles leaving from the area of the Hama Military Airport. Video footage from one source suggests that the convoy was comprised primarily of civilian trucks as opposed to military vehicles. Reports that the convoy consisted of 200-250 vehicles by the time that it left the vicinity of Hama city, as well as conflicting reports of smaller convoys of different sizes and composition, indicate that the initial column of supply trucks sighted near the Hama Military Airport joined with other forces prior to departing from the vicinity of Hama city. It is clear from later reporting and video evidence that the larger convoy which departed eastward contained significant armed elements, some suggesting that it included up to 25 T-72 tanks, in addition to a large number of personnel carriers, BMP attack vehicles, and support helicopters. Some sources also indicated the possible presence of irregular forces – including Hezbollah and the National Defense Forces (NDF) – within or alongside the regime convoy. 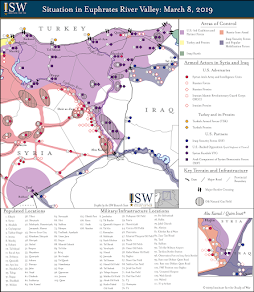 While it is plausible that conventional regime forces are operating in an integrated manner with irregular forces, which has been observed since the battle of al-Qusayr, it is not confirmed in this case, and remains unclear how such forces would interact with regular armed units in terms of roles and responsibilities. The regime’s deployment of integrated forces warrants further study, but for now the presence of Hezbollah deep in Aleppo province cannot be validated. After leaving Hama, the convoy moved east through as-Salamiya, which lies on the highway to al-Raqqa. The large size of this convoy, composed apparently of supply trucks, point the regime’s ultimate goal of resupplying its besieged troops at the air bases and as-Safira. There are no reports of rebel engagements during the first part of the convoy’s journey, likely because the desert route is sparsely populated east of Hama. Upon reaching the village of al-Athriya, the convoy turned north towards rebel-controlled Khanasir, an important link in the Salamiya-Aleppo ground supply route. Rebel forces first seized control of the town in late August and continued to liberate a number of other villages in southern Aleppo throughout September as part of the wal-‘Adiyat Dabha operation. Prior to August, however, Khanasir was regime-controlled, and rebels were limited to long-distance rocket attacks on passing supply convoys in order to disrupt regime combat service support in Aleppo. Just before arriving to Khanasir, reports indicate the regime convoy paused for a few days on September 30 near the village of al-Qurabatiya, just 5 km south of Khanasir, to receive additional reinforcements from Hama. During this time, regime planes and helicopters saturated Khanasir and surrounding villages with barrel bombs, more than 30 by some accounts, as well as shelling, in order to prepare the area for a ground assault. When the regime forces began to move into Khanasir, rebel forces were quickly outgunned, and by October 3, the city had fallen back into regime hands. The use of barrel bombs, which are basically improvised explosive devices dropped from planes and helicopters, by regime forces has become increasingly visible in recent months, particularly in Idlib and Aleppo provinces. These barrel bombs, which are not precision guided, are generally filled with oil, explosives, and metal, which sends shrapnel out over a wide area for maximum effect. Their heavy use in areas where the regime has a lighter ground presence could be indicative of a scorched earth policy of indiscriminate destruction to regain rebel-held territory. It could also point to decreasing reserves of standard ordinances and greater difficulty the regime faces in receiving new weapons shipments from abroad. From Khanasir, the regime continued to press northward towards as-Safira on a route that skirts the shores of Lake Jabbul. Unlike the desert highway outside of Hama, both this route and the nearby Safira plains are populated with small villages, and regime forces suffered heavy losses along the way, including a rebel car bomb and large ambush. While regime forces were able to overrun a number of small villages from October 5-8, and even prematurely declared the Salamiya-Aleppo Highway open to civilian traffic, there are reports that rebels recaptured villages soon after the convoy departed. On October 8, after receiving additional reinforcements from Tal Abour near Aleppo, the regime finalized preparations for an assault on as-Safira by beginning a devastating campaign of air strikes and bombardments on the city. As-Safira is an important city for several reasons: it is a key location on the alternate supply route to Aleppo, in close proximity to both the besieged Kuweires military airbase to the east of the city and the Nayrab military airbase, which is co-located with Aleppo International Airport; and the outskirts of as-Safira are home to site of some of Syria’s biggest chemical weapons research, production, and storage facilities. While the large number of supply trucks in the convoy suggest that the primary mission was to re-establish ground supply routes to besieged bases, with the OPCW inspectors visiting chemical weapons sites around the country it is likely that securing the area around the Safira complex in preparation for their visit was an additional objective of the regime offensive. By the time the regime attempted its assault on as-Safira, rebel forces had received their own reinforcements. This is indicated by the FSA-affiliated as-Safira Operations Room, which issued a statement thanking all of the units that responded to their earlier call for assistance. The rebel forces participating in these battles include both Free Syrian Army brigades, coordinated by the as-Safira Operations Room, as well as more extreme Salafi Islamic groups including Ahrar al-Sham, Jabhat al-Nusra, and the Islamic State of Iraq and al-Sham. As of the time of posting, the battle around as-Safira was ongoing, with the regime still unable to make major gains north of the city. If the regime is able to wrest control of as-Safira, it will be a major setback for rebel forces, who have been building up their presence along the Hama-Aleppo supply route since at least the beginning of the summer. With control of as-Safira the regime would not only have an open supply line to southern Aleppo city, it would also have a clear route to Nayrab and Kuweiris air bases. Both sites have faced challenges in ground resupply, and Kuweiris Air Base in particular has been under constant rebel siege for many months. Large-scale aerial resupply is not a sustainable strategy for the Syrian regime, particularly with capacity at all of its airports frequently diminished due to attacks. The regime must control a ground supply route to its remaining strongholds in Aleppo strongholds if it hopes to hold onto them and to make future gains in the northern Syria, where rebels continue to consolidate their gains. The date for Iraq’s national parliamentary elections has been set for April 30, 2014. However, the law governing the conduct of these elections has not yet been passed. Debate over this law provides a venue for major political groups to establish conditions that will favor them in the upcoming elections. The debate also has the potential to cause tensions between the Iraqi Arabs and Iraqi Kurds. If these tensions become too heated, they risk providing an opening for Al-Qaeda in Iraq. On October 7, the Iraqi parliament, known as the Council of Representatives (CoR), votedto set April 30, 2014 as the latest date to hold the 2014 national parliamentary elections, which will determine who is the next prime minister. This vote came after several rounds of delays in voting on a law that will govern the conduct of the elections. In its statement, the CoR indicated that if an elections law is not passed by October 30, 2013 it will initiate “legislative measures” to amend a previous elections law. The passage of an elections law in Iraq is an opportune moment for Iraq’s various political groups to establish conditions that will favor them in the upcoming contest. The process normally takes extensive negotiations and attempts to build consensus among the various factions. The negotiations over the 2014 elections law will follow a similar process. However, they are shaped by theaftermath of the 2013 provincial elections and are currently characterized by renewed political tensions between the Iraqi Arabs and Iraqi Kurds. Prime Minister Nouri al-Maliki’s State of Law Alliance (SLA) underperformed in the provincial elections and has since been reachingout to the Iraqi Kurds. Thus, the debate over the elections law is a test for the rapprochement between Baghdad and Irbil. Meanwhile, the Iraqi Sunni electorate was fragmentedin ways that benefited the Iraqi Kurds, especially in Ninewa province. At the moment, Iraqi Sunnis view the elections law debate as an opportunity to regain unity on important issues such as elections in Kirkuk. The aftermath of provincial elections in the elections law debate has manifested itself in the behavior of the major political groups as well. They are seeking to marginalize the smaller political groups by changing the seat-allocation system which was used in the last elections. Meanwhile, the Iraqi Kurds are testing Maliki, who was likely motivated to rebuild relations with them after the SLA’s disappointing performance in the provincial elections. As the political groups posture for the next round of negotiations, setting an elections date is an important milestone. The overwhelming vote to do so indicates political fears that the poor security environment could lead to postponing the elections. The prospect of postponing elections will be damaging, as it will cause further citizen distrust in the political system and undermine the legitimacy of the government. Drafts of the elections law in its different, proposed versions have not been officially released. Nonetheless, the issues under contention are widely reported. The CoR’s debate is centered on amending the elections law of 2005. First, there was a discussion about whether to use an open-list system or closed-list system in the elections. The open-list system, which was used starting in the 2009 provincial elections, allows the voter the opportunity to elect candidates they recognize since the vote can be given to a specific candidate. In the closed-list system, on the other hand, the votes go to the candidates according to their ordering on the electoral list, which is determined by list leaders. This dynamic gives political leaders greater leverage since they will be able to choose who gets to be higher on the list and thus receive more votes. The open-list system takes away that power. It is in the interest of the political groups’ leaders to legislate a closed-list system. According to a leakeddraft of the law, the open-list system will again be used in the 2014 elections. This is likely accurate given the success of the open-list system in elections since 2009. Voters would likely not accept a closed –list system and any political group pushing for it may be electorally punished. There is also debate over how votes should be counted. Iraqi Kurds are advocatingfor the country to be treated as a single electoral district whereby the votes for any political group nation-wide will be counted towards the total number of seats. Practically, a single-district system will be beneficial for the Iraqi Kurds since it will allow them to gain seats through the votes of the Iraqi Kurds who live in provinces other than Iraqi Kurdistan. The alternative is a multi-district system which counts every province in Iraq as a separate constituency and the votes in that province will be limited to the province. On October 6, Iraqi Kurdistan President Masoud Barzani calledfor establishing a single-district system and added that the Iraqi Kurds were subject to “injustice in the 2010 elections” when the multi-district system was adopted. Barzani threatened a boycott by Iraqi Kurds if a single-district system is not adopted. Member of Maliki’s SLA, Ammar al-Shebli, statedthat the boycott threat by Barzani is a maneuver in order to gain leverage on other issues pertaining to the elections. Other important issues for the Iraqi Kurds are elections in Kirkuk and the issue of compensatory seats. For the Iraqi Kurds, elections in Kirkuk are important especially in light of the recent Supreme Court decision that cancelled the governance power-sharing provisions in Article 23 of the 2009 provincial elections law. Article 23 was voted on in 2008 despite objectionsfrom the Iraqi Kurds and was meant to address Arab and Turkmen grievances with regards to local governance. The article statedthat local elections in Kirkuk should be held after senior provincial posts are equally divided among the province’s ethnic groups. As the debate on the elections law continues, there are attempts by Iraqi Arab and Iraqi Turkmen parties to reintroduce power-sharing mechanisms pertaining to Kirkuk in the national elections law. The Iraqi Kurds have voicedobjections to those attempts and viewthem as a vehicle to extract concessions from the Iraqi Kurds. The attempts to raise the issue of Article 23 concern the results of the provincial Kirkuk elections, but efforts by Iraqi Arab and Iraqi Turkmen parties indicates the linkage between national elections and issues arising from the provincial elections. It is important to note that the partial cancelation of Article 23 was likely the result of a political deal between the Iraqi Kurds and Maliki, who had been weakened after the provincial elections. As a quid pro quo, the Iraqi Kurdish ministers returned to the cabinet after an earlier boycott, and the Kurdistan Regional Government has even offered to assist Maliki by deployingthe Peshmerga alongside the Iraqi Security Forces. In addition to the provincial parliamentary seats, political groups can secure seats based on their votes from what are known as national compensatory seats. These seats provide a pool for all parties to draw upon after the elections. Iraqi Kurds are demanding that 75 compensatory seats be provided, while the all-Iraqi Shi‘a National Alliance is consideringthe allocation of 32 seats total. Iraqi Kurds – who have 57 seats in the incumbent parliament – are seeking to maximize their electoral fortunes as the negotiations over the law continue. Finally, major political groups including the SLA, the Iraqi Kurds, and Iraqiyya appear to be attempting to change the seat-allocation system. The system used during the provincial electionsallowed smaller political groups to benefit and secure seats at the expense of the major groups. Therefore, major groups are pushing for a new system that will change that dynamic, making it easier to exclude minor political groups. Accordingto the leaked draft of the law, a new system favoring the major groups is likely to be adopted. Accordingto Prime Minister Maliki, the elections should be held at their scheduled time with a law that adopts an open-list and multi-district systems. This stance is the likely result of pressure from the religious authorities in Najaf (Marji‘a) which has reportedly been pushingfor elections to be held on time. However, Maliki may be trying to appear as an Arab nationalist, supporting a unified Iraqi Arab call for a multi-district system in opposition to the Iraqi Kurds. Evidence of this can be seen in a reportedclosed meeting that excluded the Iraqi Kurds between the predominantly Iraqi Sunni Iraqiyya and the National Alliance, which includes Maliki’s SLA, to discuss the elections law. The Iraqi Kurds reacted to this possible development by warningthat an attempt to pass the elections law without the Iraqi Kurds would have repercussions on Baghdad-Irbil relations as did the vote on the 2013 budget debate, during which Iraqiyya and Iraqi Shi‘a parties voted on the budget without the Iraqi Kurds. The Iraqi Kurds reacted to the budget vote by withdrawing their ministers from the federal cabinet. SLA member Abbas al-Bayati stated that this possibility is unlikely this time because the SLA would seek to have a consensus vote including the Iraqi Kurds. The discussions over the law will continue and it will be important to watch whether it would lead to delaying the elections despite the newly-set date. Additionally, it will be critical to watch if heated rhetoric between the Iraqi Arabs and Iraqi Kurds over Kirkuk leads to changes on the ground – including a military confrontation between the Iraqi Security Forces and the Iraqi Kurdish Peshmerga. The current tenor of the elections law debate is a political showdown between the Iraqi Arabs and the Iraqi Kurds. This discussion will help mobilize the electoral bases for both groups. However, it has the potential to escalate due to the stakes involved in the elections. By resurfacing the discussion of Kirkuk, the Iraqi Arabs and Iraqi Turkmen are using the debate to strike back against the Maliki-Iraqi Kurdish rapprochement which has so far been beneficial for the Iraqi Kurds. The Iraqi Sunnis are, for now, seeking to regroup, and emphasizing the Kirkuk issue may provide them with a boost. On October 7, CoR members of Iraqiyya criticizedthe Iraqi Kurds for their electoral stance and emphasized the significance of Kirkuk for the Iraqi Arabs. This eliciteda rebuke from Kirkuk’s Iraqi Kurdish CoR Member, Khalid Shwani. An Iraqi Arab-Iraqi Kurdish escalation will be advantageous for al-Qaeda in Iraq (AQI). AQI is resurgent and has in the past capitalizedon the Baghdad-Irbil tensions to gather strength. It will, therefore, be imperative for the Iraqi political groups to tone down the rhetoric with regards to Kirkuk and agree upon a law taking into account the concerns of the various groups involved. Not doing so could lead to further deterioration in security. 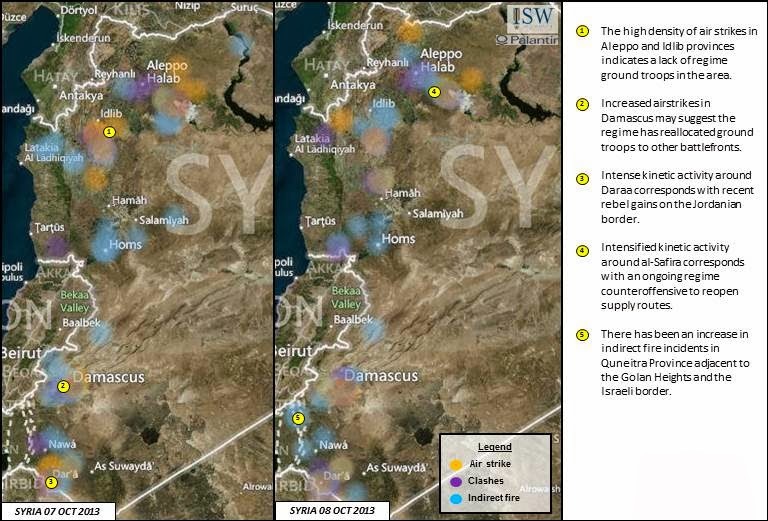 The heat map below shows direct clashes and indirect fire between regime troops and rebel forces and regime air strikes in Syria from October 7-8, 2013. We will continue to periodically provide updated heat maps as the situation in Syria develops. On September 24, 2013, a document entitled “Statement No. 1” was published on al-Tawhid’s website in which 11 fighting groups – including a number under the umbrella of the SMC and the al-Qaeda linked Jabhat al-Nusra – announced a call to unity under an Islamic framework based on Sharia law, rejecting the transitional government of the Syrian National Council under the leadership of Ahmed Tohme (detailed in a previous post). While this “Islamic alliance” itself does not appear to have materialized into a tangible coalition, the move did spark a flurry of behind-the-scenes maneuvering that may have very real implications for the rebel forces and for the future of Syria. 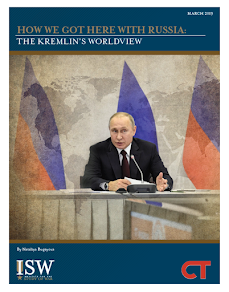 In the days immediately following the announcement on September 24, there was a notable lack of public reaction from many key players, including Jabhat al-Nusra, General Salim Idris, and the Islamic State of Iraq and al-Sham (ISIS). On September 26, SMC head General Salim Idris announced he would end his visit to France early to head to Syria to “follow up with the field commanders and work toward unifying all the ranks,” referring to the eleven rebel leaders who signed the document. The next day, Jabhat al-Nusra renounced its participation in the Islamic alliance statement, noting that although an ISIS local commander signed the document, it was not approved by their central leadership, and that they rejected the attempt to create controversy between them and ISIS. On September 29, 2013 a new coalition was formed, called Jaysh al-Islam (Army of Islam). In a professionally-produced ceremony in the Damascus area, the leaders of 50 brigades pledged allegience to Sheikh Zahran Alloush, the leader of Liwa al-Islam, and a complete list of the 50 brigades consolidating under Jaysh al-Islam was published in both Arabic and English. Although many of these units were already operating under the leadership of Liwa al-Islam, this move reinforced their status as one of the strongest fighting groups in Syria. Jaysh al-Islam does not include the al-Qaeda affiliated Jabhat al-Nusra, and rejects the leadership in exile of the SNC. Liwa al-Islam, and by extension Jaysh al-Islam, is backed by Saudi Arabia. Shortly after Jaysh al-Islam was announced, Ahrar al-Sham (the leader of the non-FSA Syrian Islamic Front and also one of the strongest fighting groups in Syria, which is not part of the newly-formed Jaysh al-Islam) – published a statement that along with two other brigades it was withdrawing from a Damascus Operations Room that had been formed only a week earlier among six groups, under the leadership of Zahran Alloush of Liwa al-Islam. This operations room was made possible through funding provided by a group of Kuwaiti Sheikhs called the Council of Supporters of the Syrian Revolution in Kuwait. Ahrar al-Sham's announcement pointed to the existence of tension between Operations Room's six members over their leadership structure and decision-making process, indicating a struggle for dominance. On September 30, Abu Muhammad al-'Adnani, spokesman for ISIS, released an audio speech entitled, "May Allah be with you, Oh Oppressed State." In the speech Adnani accused the media of conspiring against ISIS by launching false accusations, making ISIS look more ruthless than it is, and downplaying the group’s victories. It seems clear from this defensive and angry statement that ISIS is feeling the impacts of political criticism and more direct measures being taken against it on the ground. On October 2, a statement was released by six of Syria’s most powerful brigades regarding the fighting that has been going on in Azaz between ISIS and the FSA-linked Asifat al-Shamal. Notably, the signatories included rebel power players Liwa al-Tawhid, Ahrar al-Sham, and the newly consolidated Jaysh al-Islam. The statement called for a ceasefire, for ISIS to withdraw to their headquarters, and for the matter to be handled by a Shari’a court in Aleppo. Thus far there has been no indication that ISIS is complying with the statement, and it is not clear if the signatories intend to take action to enforce it. But the fact that these units have coordinated their messaging is notable, and the anti-ISIS sentiment seems to be emerging as a coherent thread throughout the continued shifting and reorganization of rebel groups within the armed opposition. Also on October 2, we saw another notable reorganization as four brigades in the eastern part of Syria in Deir Ez-Zor broke ties with the FSA to form Jaysh Ahl al-Sunna. With a logo that closely resembles that of the new Jaysh al-Islam, it seems likely that they are closely linked. The Western-backed political opposition leadership is in trouble. Though the Islamic alliance announced by al-Tawhid on September 24 may not have amounted to much, it seems to have ignited a chorus of rejection by fighting groups of the Syrian National Council leadership in exile. Of the recent groups to have rejected the SNC leadership, Jaysh al-Islam and its affiliate in Deir Ez-Zor are likely to have staying power as they are already active in major offensives on the ground. Syria’s rebels are following the money. This burst of reorganization seems to be propelled in part by influential sources of support coming from the Gulf. Saudi Arabia in particular has been active behind the scenes in the past week. Publicly, their frustration with the weak response by Western allies bubbled to the surface when they took the unprecedented step of canceling their speech at the UN General Assembly. Rebel alliances are forming which, while not yet explicitly opposed to the two al-Qaeda linked groups in Syria, have in practice demonstrated the will to address ISIS in Azaz with the statement released on October 2. Jabhat al-Nusra has a better track record of cooperation with other members of the armed opposition, so it is encouraging that they are not a party to the most recent alliances and were quick to back away from the September 24 Islamic alliance statement which gave the appearance of grouping them in with other fighting groups as opposed to ISIS.